I’m not the kind of person you’d invite to write up a cosmetics promotion: I don’t wear make-up or buy much in the way of “products”, but THANK YOU Suzan the Aquarian for inviting me to last night’s demonstration of the newly launched Dr. Hauschka make-up range, I thoroughly enjoyed the evening! Thank you too, to Karen from Dr. Hauschka and the wonderfully diverse group of ladies who attended the event: what an interesting bunch we were! Artists, bakers, a schoolgirl interested in taking care of her sensitive skin, an acne-stricken-boy’s mother, a teacher, all of various nationalities: where else would we have come together to celebrate the enhancement of natural beauty? . . . our own beauty! It did appear, at first glance, an unlikely place for a highly skilled make-up artist to be giving a cosmetics demonstration (a few rows of chairs in the middle of a health shop, surrounded by foods like seaweed snacks and organic coffee). However, this backdrop was perfect for the Dr. Hauschka range. Karen is clearly delighted to be representing Dr. Hauschka and happily explained their natural and organic approach to skin care and decorative cosmetics. Karen was generous with beauty tips throughout the evening. One that struck me was that the optimum amount of product is often a lot less than we tend to use (less is more); warming a cream between our fingertips makes it easier to spread onto our skin, meaning that we don’t overload the face with too much, inadvertently causing instead of solving problems. Also using less each time means the tube/bottle/jar lasts longer and isn’t actually as pricey as you might think! Karen created a delicious rosy atmosphere with the facial care products which we were encouraged to spray over, dab on, spread around, and generally test out for ourselves on our own skin. Suzan provided a similarly fragrant elderflower cordial with her refreshments, to keep us going!! . . . and this luxurious pampering was just the beginning! There was no need to drag out a volunteer from the audience for the make-over!! I don’t think I was the only one present who was fascinated, even mesmerised, by the process of bringing out Jenny’s natural beauty. Pretty much everyone queued up afterwards for a personal consultation. Now, I wouldn’t be one to wear foundation, mascara or any kind of what I call “pretty dirt”, but I must say I could see that the Dr. Hauschka products were doing what they are supposed to do, and I have to admit that I’m almost tempted to experiment with lip colour, for the first time in my life, since playing with my Mum’s lipstick when I was a child!!! 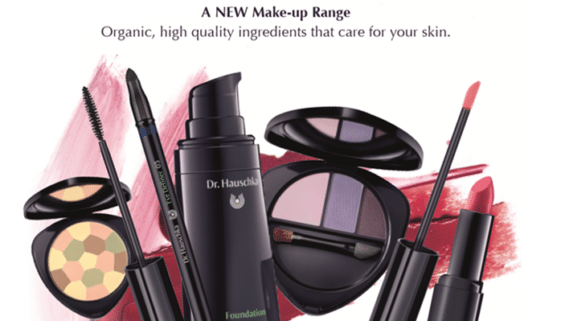 I didn’t take advantage of the opportunity last night, but the opportunity is still there, the Dr. Hauschka make-up range is here in Cahersiveen, waiting for us to try it out, have fun with it (that’s what Karen said) and maybe find a new look. Karen also recommended Yasmin, our very own highly talented make-up artist – it’s all happening at The Aquarian! !